The September Visiting Teaching Message is about our responsibility to nurture the rising generation. 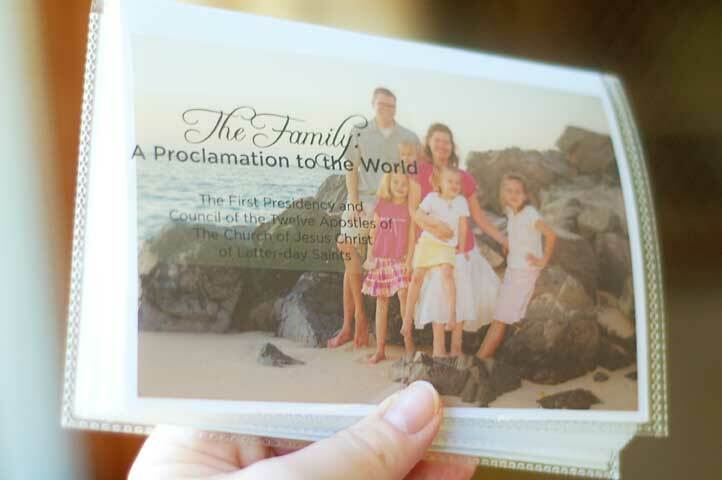 One of the suggestions in the message is to share a copy of the “The Family: A Proclamation to the World” with our sisters. 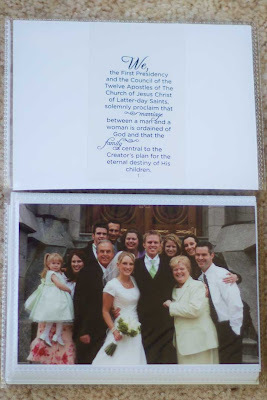 I thought it would be fun to make a 4×6″ photo book with the words from the proclamation printed on transparencies, then placed on top of corresponding family photos. I bought a 36-photo album from Wal-Mart for $1.00. There are plenty of pages to layer the text over photos, and also to have some pages with just text (like the photo above), if the photos are too busy to layer words over. It definitely works best if the photos have a light-colored background. You can, however, still see the text on a little dark or slightly busy photos. My transparencies seem to be staying put without adhesive, but I may experiment with some paper glaze (made by Aleene’s) to see if it adheres invisibly. I love breaking up the proclamation into small bites like this, to really think about each part and what it means. My children love seeing it alongside our photos. It’s much more meaningful. Make sure you buy the transparencies that are meant for your printer – whether inkjet, laser or copy machine – and follow printing directions on the package. 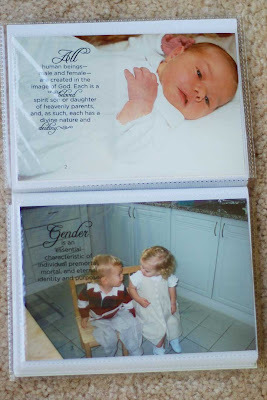 You could also print on cardstock and make a little paper album. Please leave a comment and let us know how you use this download! One last thing – I made a duplicate of this quote: “Successful marriages and families are established and maintained on principles of faith, prayer, repentance, forgiveness, respect, love, compassion, work, and wholesome recreational activities.” It is printed all together in one place, and then printed as separate words on the last page, in case you want to use a separate photo for each principle mentioned. 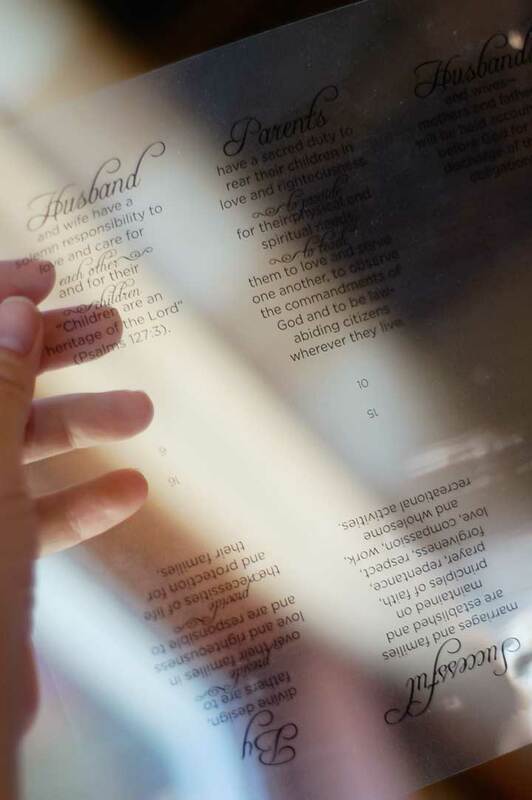 Click here to see how I presented the book and transparencies. Hope this is a fun project for you and your families! This entry was posted in Proclamation on the Family. Bookmark the permalink. I love this idea!! It is great to share with the sisters but I am also going to make one up for my children. I think it is the perfect "quiet book" to look at during church. Maybe we can even put it together as a FHE project. I'm loving you sister! I really admire you so much! You are my inspiration! (*tears*) I'm so excited to check your blog and be inspired. You are so amazing. You are helping me so much! Absolutely an amazing idea!! One question though…if this is for our v.t. how do we do this if we don't have any photos of their family? Becky – I agree, I think this is a perfect quiet book, too. My girls love it and will sit quietly with it and enjoy the pictures and passages for extended periods. Jocelyn – I'd love to do a guest post. Thanks for asking! MuaHRi – Thank you for being so kind. You are welcome! sister a. – very good question. I plan on bringing the book I made as an example, then bringing an empty brag book with the uncut printed overheads as a gift to my sisters, so they can make their own. I'll probably slip them into a large envelope to keep them safe. If I come up with a cute presentation, I'll share it. I read this the other day and have been thinking of how to do it as well for the sisters I visit. A book with quotes that they can fill with pictures sounds great. I had another thought this morning of maybe finding one of those big frames with 20 or 30 spots for smaller pictures…maybe it would be a fun way to post the pictures and quotes in there?? I love this idea! Thanks for getting it up so early! How do you already know what the September visiting teaching message is? Carbonneau – A big frame would be fun! Great idea. Megan – lds.org usually has the the next month's visiting teaching message online sometime around the 12th of the previous month. I love this! Amazing work! I'm going to use this for my sisters this month! Thank you! Thank you so much for this idea! I have been wanting something like this for awhile but didn't know how to make it work. You always give great ideas that anyone can do. Thanks for sharing your talents with us all. This is beautiful!! Did you see the article in the September Ensign "Bringing Christ into our Home"? I think it would be great to make a book like this with pictures of Christ and the "Living Christ" words inside. Thanks for your great ideas for VT! Love this idea and I want to do it!! Where do you get the transparencies? Cindy, I got mine at Staples. Wow! I love this idea! I am going to make one tonight Thank you for sharing. Your album is beautiful! Sister, will you be posting a SPANISH version. I noticed that you have in the past but not for the recent months. It would be such a blessing if you'd share your amazing talent with us Spanish sisters too. Thank You. Hi Jocelyn. I'm sorry, but I won't be posting a Spanish version at this time. It actually takes quite a bit of time to work the translation into the text format that I'm using, and I am not able to do it this time around. I will keep it in mind for the future, though! I have been thinking a lot lately on how to make my VT visits more meaningful. I just came across your site, I am so excited to do this for my sister! Thank you so much for taking the time to share this wonderful idea! I am not able to view Septembers and was wondering if you've had any problems with it? Major kuddo's to you! I thought I was creative till I stumbled upon your site awhile back and have been so impressed and you continue to get better and better! A – I just checked the links and all seem to be working! I am going to give it to my children as they leave home for school so that they remember what is important. I am in awe of your creativity! Thanks for sharing with us! I'm heading out to Wal-Mart and Staples this weekend! You are brilliant! I'm giving these to my brothers and sisters for Christmas presents (and my children). Such a treasure! I love this idea! I think it would be great to make one for each of my children (even the grown ones). Thank you so much. Oh, this is cute, I will make one for my granddaughter. thanks for sharing. This is such a great idea!! Perfect for a Family Home Evening project. Thanks for sharing! That's fine with me, Stacie. Hope your book turns out great! I'm going to make it into a photo calendar to give to Grandma and Grandpa for christmas! This looks totally fun! I'm going to recommend it for one of our RS workshops. I just discovered your blog and am looking forward to going through your archives! This is totally brilliant!!! Thank you so very much for being so generous & sharing with your talents!!! I'm thinking of using this as a great homemade Christmas gift idea! My question is, has this same kind of format/idea been done with the Living Christ declaration? I would LOVE to see this same treatment with that as well! Thank you thank you thank you!!! i absolutely love this idea for September, thank you so much for posting it!! i actually printed the Proclamation Pieces out on different colored paper and cut them all up and rounded the corners and put them on the front and back of a folder. Then i put a copy of the Proclamation in document protector inside along with a note from me for my sisters (i do a "card" route). Thank you for all your hard work and dedication!!!! I absolutely love this! Would this be something that you would be willing to let others use for a Super Saturday project? Yes, Robyn – and have fun! I’m serving in the Spanish Branch right now and LOVE that you post your efforts in Spanish, it is So helpful. My Spanish is only moderate, so these always help me to communicate with my sisters. I wanted to say for anyone else that was looking and a little sad this time to just Google the proclamation in spanish, or go get it from lds.org because they have it in spanish. Sure we’d have to do the work of cutting it up and making it cute, but maybe we’ll appreciate all the hard work you do for us just a little bit more! I really appreciate your attention to detail. I’m going to make this and see if I can use an editor to put some of the words right on the picture. 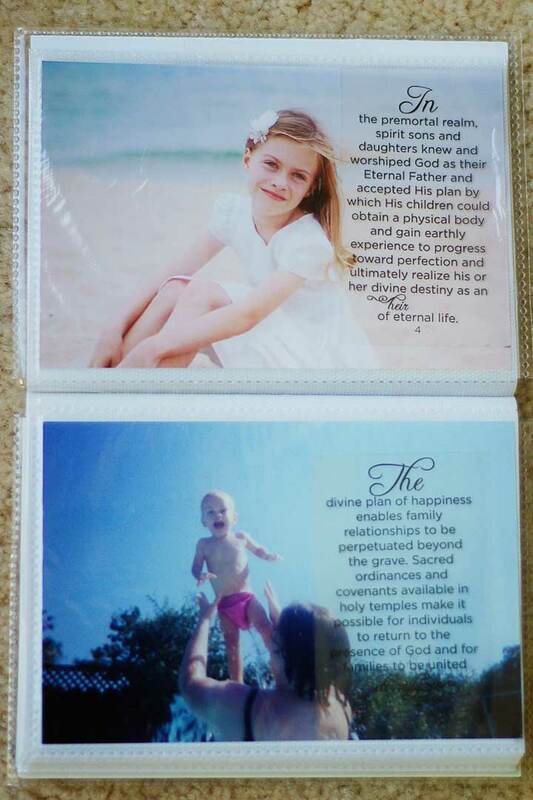 i have also been meaning to make a 4×6 ‘cousins’ book and “lds” book for the kids at home and church respectively. i just found your idea through pintrest and will be back to your site! thank you. I just saw this on Pinterest and I’m actually already working on a book just like this, creating it on Shutterfly.com! I’m stumped with what type of pictures to use toward the end where it says, “We warn that individuals who violate covenants of chastity, who abuse spouse or offspring….” Of course I don’t have any pictures of my family that relate to this. I would love to see what you did. Maybe it will spark an idea for me. I see you posted this quite awhile ago but I was hoping that if you wouldn’t mind emailing me a picture of two that you used for the end of the Proclamation that would be wonderful! acrandell95 at gmail dot com. Thank you!!! Amanda – I left that last page without pictures, and just included the text.